Hi, I'm Harry. 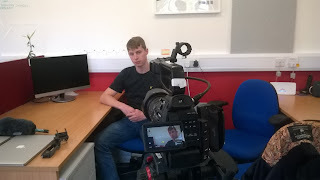 I've just wrapped up my second year of study at the University of Gloucestershire and have been in search of bright new opportunities in the film industry. This is my experience as a Market Dojo Intern. 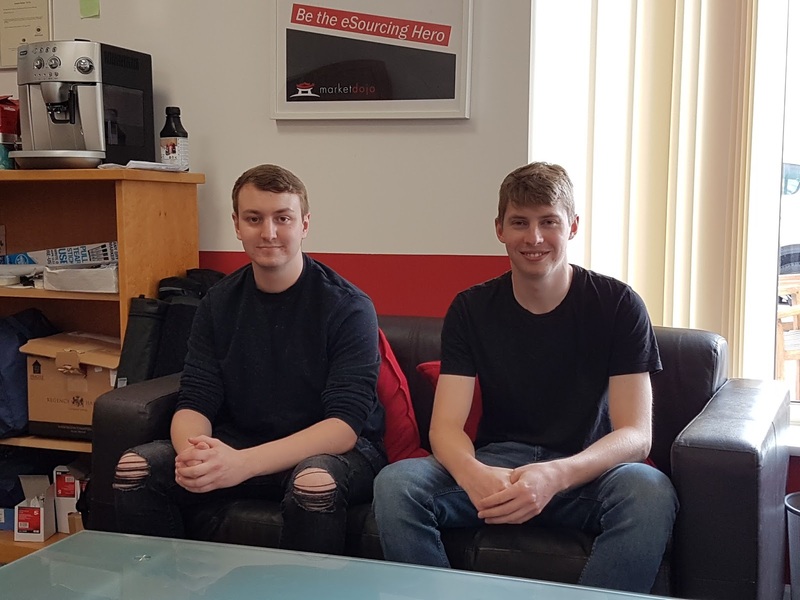 Market Dojo wasn’t a place that I thought I’d be when finishing my second year of university on a film production course, but here I am, busy working in an office from nine to five and being taught all sorts of wonderful things about procurement and social media management. When you picture working in an office you usually imagine being surrounded by a life draining amount of grey concrete and stuffy old men in suits. But to my surprise I ended up working in a cosy, bricked office building surrounded by rolling green hills and working with a team of young energetic people, an environment which is peaceful and relaxing to work in. Unfortunately I didn’t get the typical intern experience of being the office coffee boy, but my real job while Interning at Market Dojo was far more interesting. My job was to create short promotional material which they can use to market the company, a task which I was very happy to oblige with considering my background in Film Production. Ed happily obliging my request to sit and let me frame the shot. We spent a morning developing a dozen ideas all focusing on Market Dojo’s USP’s (Unique Selling Points), we needed ideas which could get across the accessibility, cost saving potential and the nature of an on demand service. Generating ideas around a company’s USP’s was an interesting challenge, something which I have learnt a great deal from. This is an aspect the Film Production course hasn’t covered yet, so it gave us new opportunities to test out our abilities. Developing an idea is no easy task though, we spent an hour generating our ideas and then another presenting and discussing them, so that we can refine them into something that is suitable to for the company to use for their marketing. We then moved on to one of the more time-consuming tasks which were storyboarding each of the ideas we wanted to bring forward or test out. 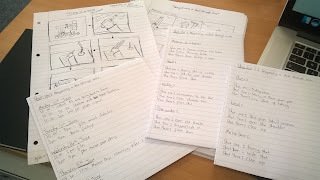 Storyboarding is a key part of the pre-production process as it allows us to plan out each shot before we begin to film, it saves us from making mistakes as we have a guideline to work from on the day. We were working on a fairly tight schedule so we had to get everything ready to shoot quickly while still keeping the production quality high. But as film students a tight schedule with looming deadlines is all too familiar to us. During the pre-production stage we decided to do two sets of video’s, one being a promotional video which is under a minute in length and another being a video which details what Market Dojo do. We chose to do these two videos as they can be used across multiple platforms while grabbing attention and informing the viewer, both being useful and covering different aspects. We started by recruiting our friend Joe to be our puppet (or as he prefers it “actor”), who graciously agreed to help us out for free. After sizing him up for outfits we got straight into filming, a process which takes a lot longer than some might think. But we were wrapped within a couple of days! 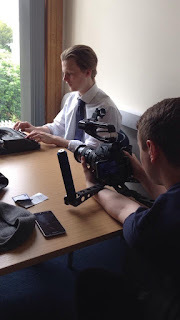 Once we got the footage we went straight into edit mode, we decided to do a few different versions of the film, each with minor tweaks to ensure we had all our bases covered. Me expertly framing a shot. 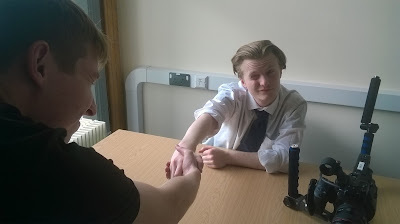 The most difficult part of being a student filmmaker is dealing with limited resources and accessibility. We didn’t have access to transport, meaning certain locations are out of the question, and our kit is on loan from the university, meaning with have limited time to be able to shoot. All these aspects are difficult to work around, but we will always find a way! I’m very pleased with how all our videos turned out and I’m excited to see what the public thinks! Overall I’ve had a great experience working at Market Dojo and feel that I’ve grown as a filmmaker with this new experience under my belt. I’m thankful for being given this first step into my professional career, so thank you Market Dojo!